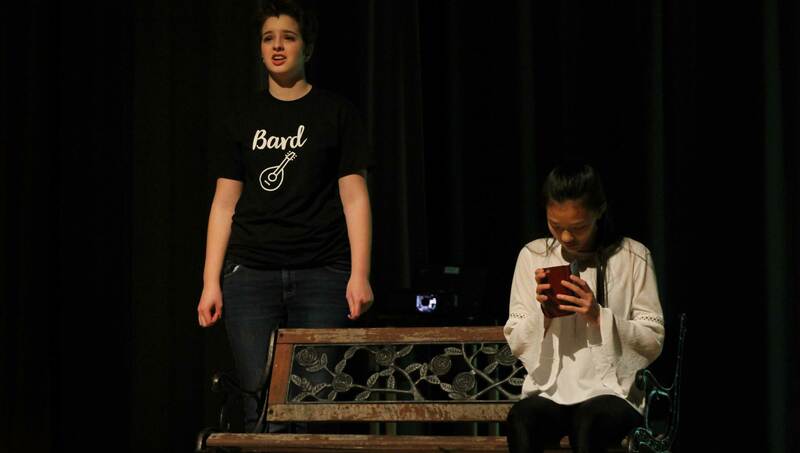 THE NARRATOR – Sarah Kurtz, 10, recounts a Shakespearean sonnet as Jennifer Yang, 9, portrays a modern-day reenactment. The cast rehearsed for over a month before the show. “I’m excited about the show because it goes several different directions,” said Kurtz. On November 2, the fall play, Will and Whimsy, opened its doors to the public and brought Shakespeare to the student body. The cast and crew of Will and Whimsy donned their costumes in class that day as they got ready for their opening. Friday night, at 7pm, community members and students alike convened in the Howenstein Auditorium to watch the drama unfold. Director, Eric Margerum, watched months of hard work come to fruition while controlling lights. Both the past and future were motivators for students to audition for this year’s fall play. “I liked doing the Jr High plays and the play last year, and I’m also very interested in acting,” said Sarah Kurtz, 10. The play has been a yearly occurrence for decades, and has ventured into many different genres. This year, it journeyed into a modern take on Shakespeare by transforming classic sonnets into a series of relatable skits. As the audience watched onstage action from their seats, fun continued backstage. When spending hours upon hours a week with other cast members, it’s only natural for bonds to form. “My favorite part was the friendships that I made,” said first time actor Lydia Leichty, 11. After the show, it was evident how close the cast had become as they celebrated a successful show with each other. Families and classmates alike presented the delighted students with carnations as a congratulations for another fruitful season.